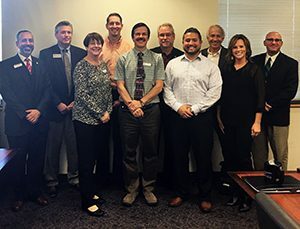 The IU East School of Business and Economics held the inaugural meeting of its Business Advisory Council including members (from left to right) Robert Mulligan, Rob Tidrow, Robin Henry, Todd Duke, Roger Richert, Ron Oler, Michael Elorreaga, Jeff Jackson, Jan Parker, and Phil D’Amico. Area business leaders and the community are invited to attend the IU Business Outlook Forum from 7:30-9 a.m. on Tuesday, November 15, at Indiana University East in Whitewater Hall. The IU Business Outlook Forum is presented by the IU East Alumni Association and the IU East School of Business and Economics. IU East student Ashley Keller is a public relations intern with A.J. Foyt Enterprises. 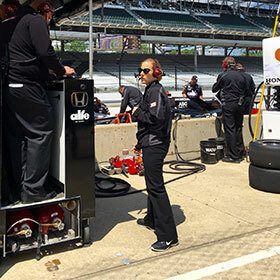 Keller is working at the Indianapolis Motor Speedway. The 100th Indy 500 is Sunday, May 29. Photo by Brooke Squibb. Indiana University East has announced a $44,000 gift from faculty member and alumnus, Roger Crane. 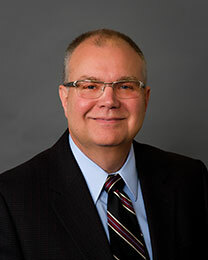 Crane, director of the accounting program and lecturer in accounting for the School of Business and Economics, said the IU East campus has been a gift to him. Seeing that many Indiana University East students and residents in the greater Richmond area might have difficulty with financial decisions, Business and Economic Research Center (BERC) faculty Oi Lin Cheung, Ph.D., associate professor of finance, and Roger Crane, lecturer in accounting, have started an initiative for the coming fall to enhance the financial literacy of the community. The Indiana University East Center for Leadership Development is hosting a Power Lunch Series for Next Generation Leaders on “Play!” from 12:10-12:50 p.m. on Friday, October 17. Sessions for this series are located at IU East’s Room 912, 912 E. Main Street in Richmond.